Ink cartridges for HP 564 / 920 / 932 / 940 / 950 are launched. Note : Most of these cartridges comes with IC chip already installed on the cartridge, so it is simply plug-and-play type. However, occasionally, we supply cartridges with a adapter type that needs to be installed into the printer, followed by the cartridge. 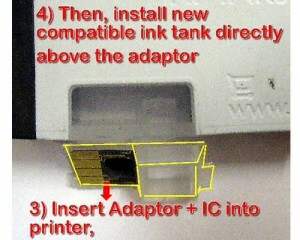 The cartridges comes with IC chip at the bottom of the cartridge, which compatible IC chip has not been developed yet. Hence we will need to use back the old IC chip. The tranfering of the IC chip is very simple. Step 1 : Remove the IC Chip by using a pen knife. Do not bend the chip, simply slide under the chip. 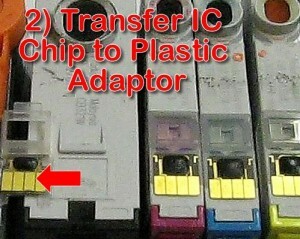 The IC is attached to the ink cartridge by a double-side tape. Step 2 : Transfer the IC Chip to the plastic adaptor provided. 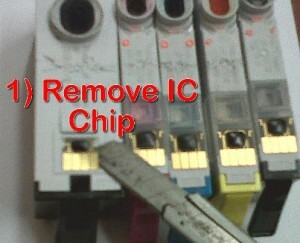 No glue is needed since the back of the IC chip already has residue double-side tape. Step 3 : After the IC chip is stuck onto the plastic adaptor, it is now ready to be placed into the printer. This IC chip shall be placed into the printer permanently. The shape of the adaptor will fit into the slot in the printer like a LEGO brick. Step 4 : Then install a new ORINK compatible ink cartidge into the printer. Printer is ready to print. When ink is used up, simply replace a new tank. IC Chip shall remain inside permanently. Note : The IC chip functions like a ID Chip such that the printer know that the right color cartridge is installed into the printer. All our ORINK branded ink cartridges comes with ink level sensor, such that when the ink is beginning to run out, the printer will know. 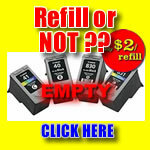 Many printer users worldwide have no idea what cartridge should be refilled, and what should not be refilled. 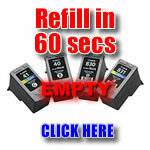 For quick profit, printer ink sellers has been selling refill ink simply for quick profits. Most of them do not give a damn about if the user’s printer is damaged or not. 1) What is Inkjet Technology ?? Very pure ink is therefore required to prevent printhead damage. -Refilling cartridge creates air bubbles within spounge. -Used cartridge (refill) tend to have dried ink at cartridge nozzle. -Dirt /impurities from bottle ink /needles. -Printer nozzle exposed more than 3 seconds during refill. -On average, 30ppm particles is formed /second from exposed nozzles. -White lines will appear after 2nd refill if printhead and ink is seperated. 3) So what cartridge to Refill? Upon cartridge taken out, residue ink on the ink cartridge holder once exposed to air will begin to dry up. 60ppm formed / second. These particles causes printhead to clog causing permanent white lines. Cons: Printhead will be damaged after several refills. Printhead damaged = printer damage = Warranty VOID. Highly popular in low GDP countries. Though there are still sellers for this in Singapore, this is a vicious cycle most users wish to avoid. Say no to refill and insist on factory made NEW cartridge under clean-room (zero dust) condition. Printhead damaged after several refills.But this is OK since this printhead would have been thrown away in the first place. It does not damage printer in anyway. Most of the time , users failed to ask / and Sellers negligently withheld information. a) As with all refilling, DIY refills always damage printhead. You can read more here the 4 main reasons of printhead damage caused by refilling due to dirt. It need to be warned that such CISS and DIY ink refill system had caused a unprecedented record number of printer (printhead) damage. Printhead lifespan had been shortened considerably due to DIY ink refill proliferation. As the printer prints, the ink level will never be in perfect equilibrium. When the pressure from the ink tank is higher, ink will leak through the cartridge. 1cm of height = 40ml of ink leak. Many CISS user find their printer soaked in a pool of ink the next morning. When the cartridge is higher level that the ink tank, the air pressure in ink tank is lower, ink will backflow into the tank, and air enters from the printhead into the cartridge. When the printer prints without any ink at the printhead, the printhead overheats and burn. Are there savings using CISS? Absolutely NOT. 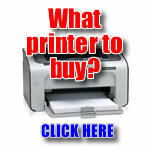 If you have purchased the right printer from the beginning. If you have chosen a Brother printer, you would have realized that Brother ink cartridges consist of disposable plastic container filled with ink. The compatible cartridge for Brother printers are approximately $5 which is cheaper than the bulk ink and labour cost charged by vendors to setup such a system. So at what instance would CISS be useful? a) If you are a start-up running a printing house, but trying to save cost by printing on entry-level inkjet printer. b) You print so much photos, several hundreds at each print job, so much so that it is a hassle to change cartridge. c) And you can bear with occasional leaking.